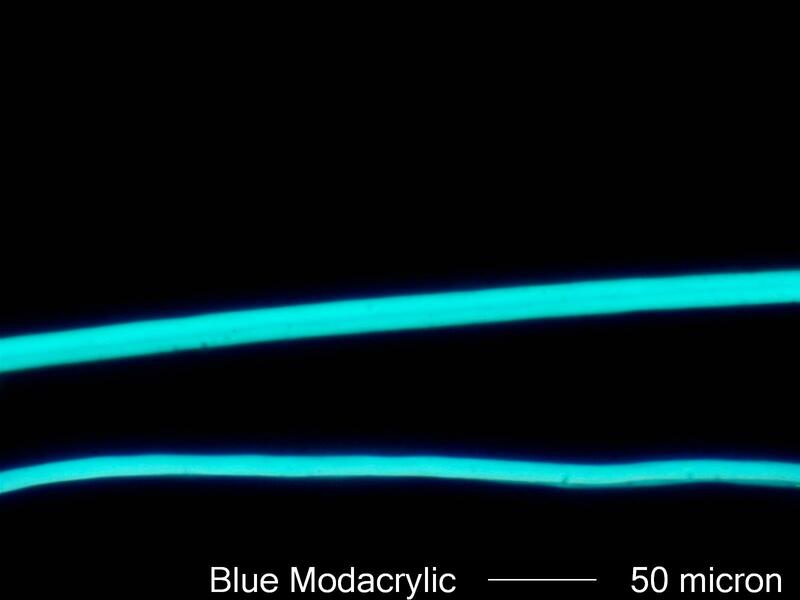 This is a sample modacrylic fiber from the sample-set provided by Textile Fabric Consultants, Inc.
Modacrylic fiber is a copolymer derived from petrolium products. It contains at least 35% acrylonitrile but not more than 85%. It is formed by drawing the polymer in solution through a spinneret into a bath where it solidifies from the outside in. This results in less than a circular cross-section because the outside polymerizes first and is drawn more rapidly though the bath than the interior of the fiber that is still liquid. The draw-rate and process affects the fiber diameter, birefringence, and the cross-sectional shape, from nearly round, to bean shaped, to dog-bone, to slightly crinulate. Modacrylic fiber was commertially producted starting in about 1949. Acrylic fiber has a refractive index along its length of about 1.54 and perpendicular to its length of about 1.53. It has a birefringence of less than 0.01 and a positive sign of elongation. It may exhibit slight irregular striations along its length due to the crinulate cross-section of the fiber, one depression along its length in the case of the dog-bone cross-section, or appear to vary in diameter due to a bean shaped cross-section.